xmotionTM WorkForce | Services is a comprehensive mobile data solution intended to improve the efficiency, compliance, safety and utilisation of your field based workers. All through the use of mobility devices such as smartphones and tablets. work which have been completed. xmotion™’s business rules structure within the application ensure completeness of information sent and returned from the field avoiding double handling of data or information inaccuracies. Further business efficiency is created through integration with your organisations existing operational and financial systems. Through the smart use of customisable attributes, the structure of a work request is highly flexible, allowing the solution to cater for many services orientated business such as electricians, maintenance and construction workers. xmotionTM WorkForce | Services utilises the capability of the xmotionTM WorkForce server, providing business with both transport and field services management requirements the efficiency of one platform for managing activity. Reduces field generated information errors. Field workers receive easy to read work specifications for each location. Capture items used on a job or specific job information requirements. Provide Field workers with a list of tasks to be complete specific to the work type being undertaken. Field Operative and Vehicle worthiness checklists. Work Request, Work Dispatch, Progress and Proof of Completion. Increase administration efficiency through integration with financial applications. Allocate and re-allocate work based on customer priorities and resource location and availability. Easily slot in last minute work requests. Delays and unable to complete work scenarios dealt with in real time. Prevent revenue leakage due to inaccurate paperwork. Billing on job completion through electronic proof of completion. Double Handling of data – work information entered just once. Understand exactly how long each work request requires on site. Respond to customer requests with real time status information. 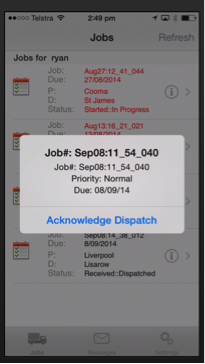 Electronic work dispatch, work cancellation and re-allocation in real-time. Schedule work within the xmotionTM WorkForce web-based user interface. 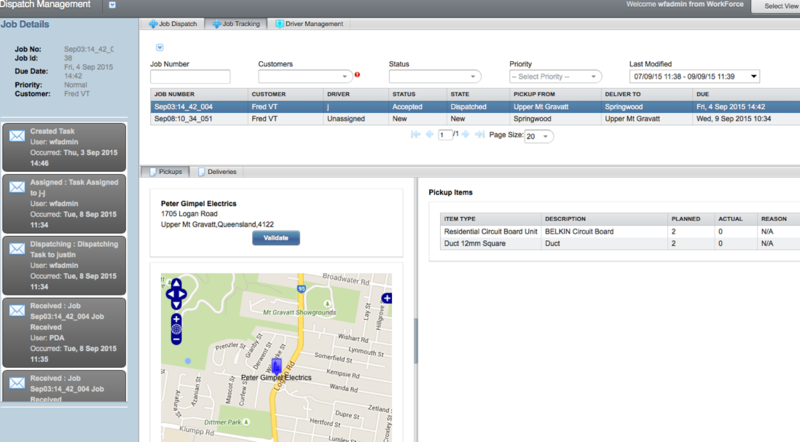 Create, manage and view the full details of work being completed (including detailed item information). Add in new customer records for a work request as it is created. View, on a map, the locations for any single work request, all work requests yet to be allocated or all work requests in progress. Dispatch work requests by dragging and dropping onto an icon positioned on a map at the last known location of the required field operative. With the click of a mouse switch between unallocated, in progress, and recently completed work. Filter work by allocated operative or customer. View the last known location of all field operatives, see whether they are currently on or offline and see how many work requests each operative currently has allocated. View near real time updates for all work in progress. Real-time work tracking information including proof of completion – sign on glass and photo. 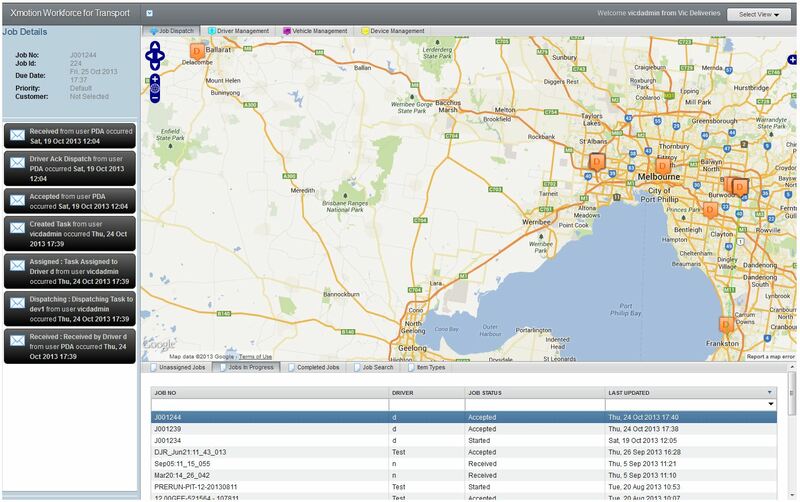 Real-time vehicle tracking information and the ability to replay vehicle journeys. Work completion details are received in real time and are available for same day invoicing. Maintain a full history of work completed, work requests received and work in progress. Business Event Management to define and capture important events such as extended time on site, late arrivals and missed work requests. Field Operatives accept or reject work requests, process jobs to completion. Easy to read work instructions. Easy to enter work activity information and items used. Capture photos and signatures when required. Record unable to complete reasons. Capture details about work completed. Automated events based on locations. Driver can optionally create ad-hoc work requests on the device. 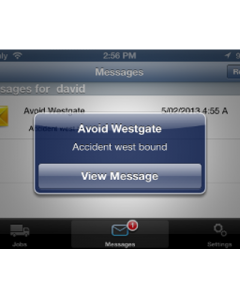 Compliance features such as Phone Controls and Automated GPS events. Integration with turn by turn navigation application. Capture when important work details change such as additional tasks completed, incomplete work. Dial or message from the application all communication time logged.